My shopping ambition whilst on holiday was to pick up products that I couldn’t get at home which now that Sephora is shipping overseas has been made easier or in the case of NYX those that I could see in person before purchasing. 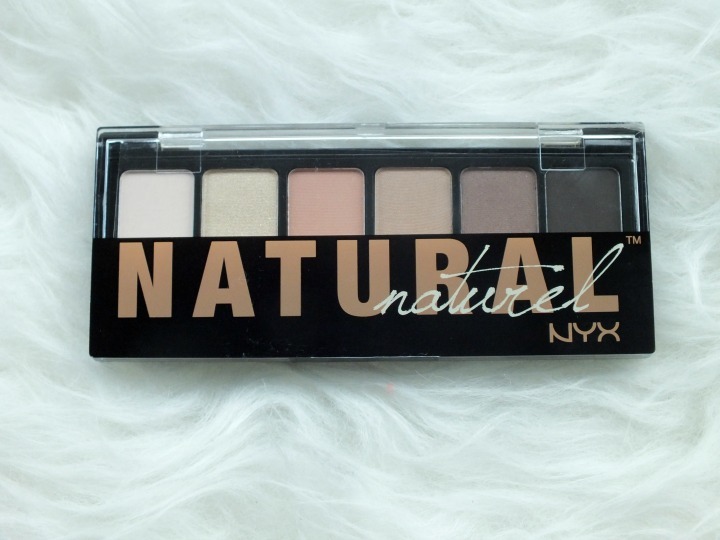 I’d read online that the NYX Natural palette was a dupe for the Urban Decay Basics palette and another from Stila. I own neither so this is not a comparison review but that of the product in its own right. Some people complain about the quality of drugstore products and yes this palette is housed in ‘cheap’ plastic packaging but I have no fault with that. A mirror would have been nice but I have 2 or 3 other products in my make up bag that have those so it’s not an issue and it’s clear casing makes it easy to see the shadows which actually in the case of high end packaging is often not the case. Inside we have six eye shadows; a soft ivory, shimmery champagne, matte peach, satin taupe and matte brown – all one would need we’d think? 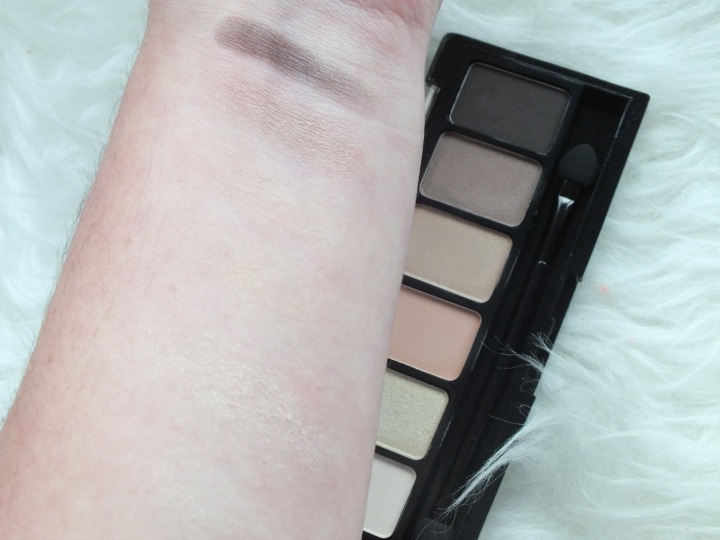 Well as you can see from the swatches with the exception of the two brown shades there is barely any pigment at all to the lighter shades, I was quite disappointed when I photographed this before using it. The texture of the shadows is chalky and it takes some effort to add these to ones lids. I appreciate this is for a 'natural' look but I assume if you're applying eyeshadow you want some evidence of it? 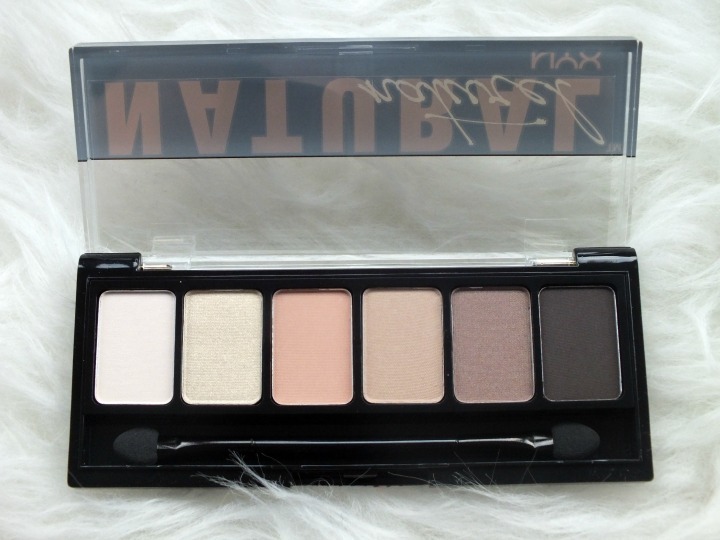 I used this palette every day last week, with and without Mac paint points, NYX Jumbo Eye crayon in Milk and nothing worked to either help with the pigmentation or longevity. They were patchy at best and creasing was dreadful. The champagne highlight was too yellow and sparkly and not in keeping with the natural feel and would look cheap and it was the darkest brown proving best as a liner only. The lighter colours don’t even perform worthy of a mention – even for a natural look. For only about $8 I can’t complain too much but what does make me sad is that those delving into their first make up journeys will start at the drugstore and pick up palettes like this. Armed with no pigmentation and poor lasting time – and don’t get me started on the sponge applicators, why are we still finding these – they will not achieve a look to be proud of. If you’re looking for good quality and pigmentation from the drugstore I’d definitely stick with Wet n Wild – cheaper at half the price. Oh I sooooo want to try some of their products but I cannot justify buying any more make up at the moment!!! What a shame, they look soooo pretty in the palette too. I have splashed out (quite often recently...tut tut, wasn't going to say with you on your spending ban 'n all!) 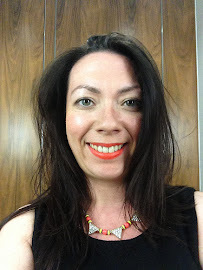 on Naked 3 - haven't used it a lot, but I love just having it there in my make-up scrum! And, yes, clear topped packaging is so much more handier; I'm sure I use stuff that I can see immediately rather than something I have to open up to see first. I guess if you're a 'pro' you instinctively know from constant use, the colours housed inside. That or you de-pot into a clear lidded palette! I know I thought this was going to be such a handy throw in the make up bag for days when I'm not interested in heavy make up etc but also no. Oh I have Naked 3 too but haven't really used it yet!! Nokia Lumia 1520 - an Apple competitor?